Climbing trees is both a skill, as well as an art form in the way it is uniquely learned and executed. Some are good at, and others not so much. But even the best climbers in the world cannot provide some of the services that a mediocre bucket truck operator can. In a bucket truck you can get out to all of the tips and tops of a tree, without putting a climber at risk of injury or death – while attempting to walk out on a limb (quite literally) that may be too small to support their weight. This means that large trees can be shaped or reduced in size artfully by making smaller cuts on the outside of the canopy. This is especially helpful in regards to getting a high quality job done on a large hedge. With a bucket truck we can come in and just take off the tips of the really long branches hanging over a house. This increases branch stability and can often even improve aesthetics and symmetry of the canopy. A climber simply cannot reach these parts as safely without bucket truck access. 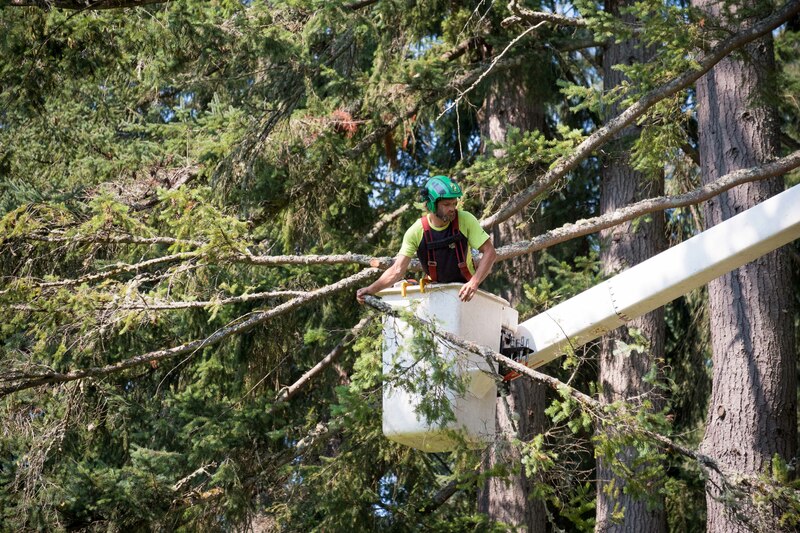 In a bucket truck, an operator can cut and manipulate the smallest pieces of a tree possible – whereas a climber may be forced to take larger tree pieces due to limited mobility. A bucket operator can cut a branch on a tree, carry it over, and drop it on the ground 40 feet away if needed – whereas a climber is forced to drop a branch underneath the tree he is in. Smaller pieces means less impact to your landscape. The bucket makes our job as a climber much easier in situations where a customer will ask us to get some low drooping or hanging branches on a different tree than what we are currently working on. What would be a difficult request without the bucket, becomes an easy task while on-site. The bucket is safer than climbing. The bucket is a known variable whereas trees often have unseen cavities and weak spots that can pose a danger to the climber. Where power lines are involved, our bucket trucks are insulated – meaning it is much less likely for the operator to become electrocuted. The same is not true for a crewman climbing a tree next to the wires. When we’re in the bucket working on a particular tree and we can reach another tree from where we are setup, we will often do a favor like this for free since it only takes seconds to move around in the bucket… whereas if we have to climb an adjacent tree, there nearly always needs to be additional costs for this service as it takes considerably more time. In short; if the tree can be reached with a bucket truck, Eastside Tree Works will almost always elect to use one of our three Hi-Ranger 76’ working height bucket trucks. It’s a higher quality service for you, it’s more efficient for us, and most importantly it’s safer for your property and our crewmen.